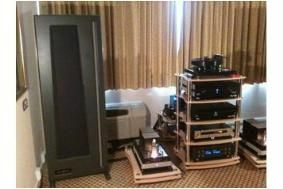 BRISTOL SHOW 2011: NAT Audio takes hi-fi to the limit | What Hi-Fi? At £80,000, could this be the ultimate hi-fi system? We've just been enjoying this extraordinary system from NAT Audio/Analysis Audio, which would set you back the thick end of £80,000. And don't forget to budget 10% on top for high-quality cables! If you're down at Bristol and want to hear the system for yourself, go to room 416 at the Marriott Hotel.